That's powerful stuff. A lot there I didn't know about. Thanks for posting. Indeed, very interesting. Where did you get the information. Thank you for sharing. thank you for posting. I'm writing an article about Picasso. been doing so much research and really appreciate your blog!!! great! thank u! and now he has been prosecuted .. This is an excellent blog post! 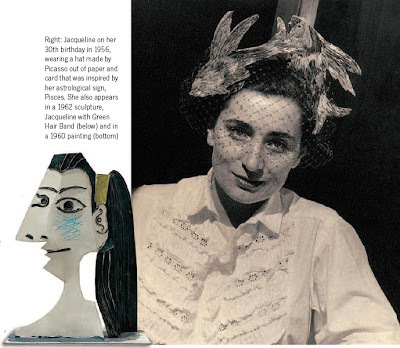 There was so much fascinating information about Jacqueline Roque in it that I did not previously know. Thanks! Beautiful story... It helped me understand why she locked out his kids for the funeral. Thank you for sharring. Most of this doesn't square with the information out there on the record. It's self-serving, and one can't blame Jacqueline for trying. One example. 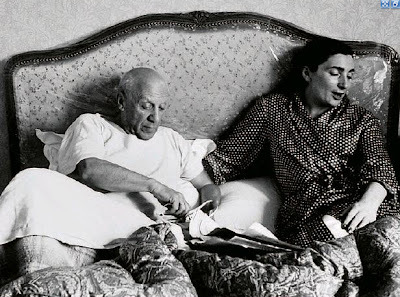 Why didn't Picasso divorce Olga? Not because it was against Spanish Law. 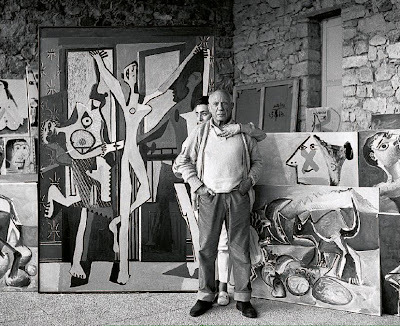 Olga and Picasso lived in France. 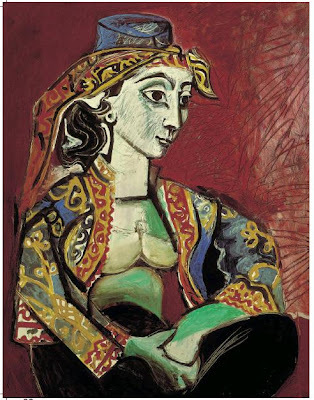 And according to French Law Picasso would need to give Olga a 50% share of his wealth and he couldn't do that (Picasso was a billionaire by today's standards). He preferred sending monthly cheques to his exes and thus stay in control. When Olga died he was free to reenter matrimony. He first contacted Marie-Therese Walther, his blonde, voluptuous Muse from the Thirties, mother of his daughter Maya and perhaps his favorite girl - redolent of course of his sexual and artistic prime. She told him he was 25 years too late. Then he blackmailed Francoise Gilot (mentioned above). If she divorced the man she had married after Picasso, well, then they'd get married and their children Pablo and Paloma would be his prime heirs. Unbelievably Francoise did divorce her husband, and while she did, Picasso married Jacqueline. And the wedding was so low key because he wanted her to feel she was not his first choice. Thanks a lot for this information, Matt. Now I know the true Picasso - the man and the boy inside the genius - for now I have discovered his heart through his love for Jaqueline, the only woman who loved him.